If you are looking for free antivirus software to protect your computer, then you should consider Microsoft Security Essentials which is provided by Microsoft. Real-time protection – Alerts will be shown to inform you if there is worm or virus detected or suspicious file/program is prevented from opening real-time. Dynamic signature service – This is a way Microsoft Security Essential checks whether a suspicious program is bad or not by pretending to run it to decide what is going on after checking against its signature database. Rootkit protection – Capable of detecting rootkit on your computer by closely monitor kernel and program on Windows Operating System by using anti-stealth technology. Detect and block bad software – Most popular websites and downloads on the Internet will be use to test by using antimalware definitions and updates of Microsoft Security Essentials in order to block bad software effectively. Windows firewall integration – You will be given option to enable Windows firewall during scan if it’s not enabled yet. This will better secure the computer from unauthorized connection to your computer. Network inspection system - Network based exploit (such as Conficker) will be effectively blocked before getting into your computer, however this feature only work if it’s installed in Windows 7 and Windows Vista, but not in Windows XP. 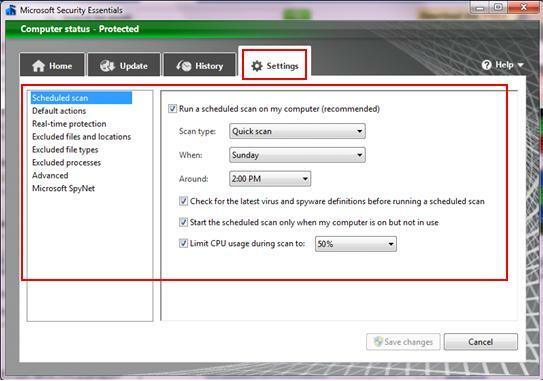 System scanning – it allows you to scan computer by using quick scan, full scan or custom scan mode. System cleaning - You will have choice to quarantine, remove or allow the detected threat. Overall it’s free and easy to use free antivirus solution to protect computer against virus, worm, trojan or spyware. It can be installed in Windows 7, Windows Vista (SP1 or SP2) and Windows XP (SP3). If you are interested, you can go to this Microsoft link to download and install this free antivirus software on your desktop computer, laptop or netbook. Once you have done the installation, the first time you run this Microsoft Security Essentials, it will download and install latest virus and spyware definitions from Microsoft network. 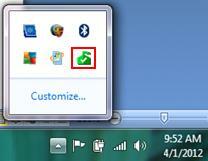 The security status of computer will be designated by Microsoft Security Essentials in green, yellow and red color code in the taskbar area. Green – No problem on computer. Yellow or Red – Need attention immediately! There is threat detected! You will be recommended on what to do next. 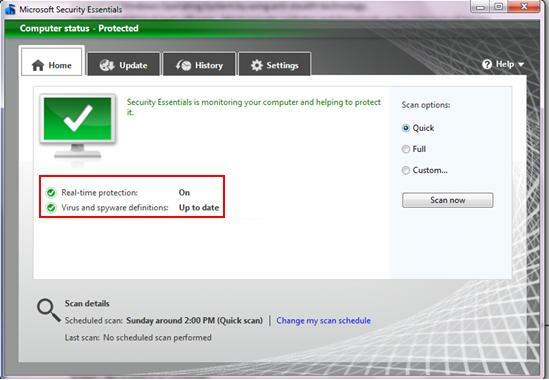 1) Once you have opened the Microsoft Security Essentials program, it shows the status of your computer (green, yellow or red), real-time protection mode, virus and spyware definitions details, scan options and also scheduled scan info. You can click Scan now to scan your computer. 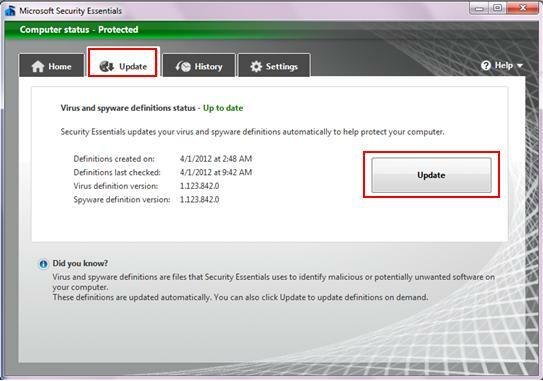 2) If you want to update the virus and spyware definitions, just go to Update tab and click Update. 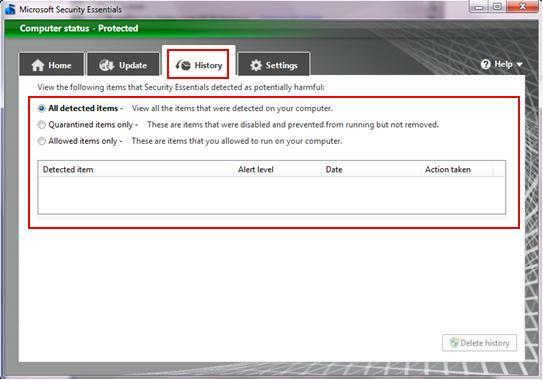 3) History tab shows those potential threats detected by this antivirus program in following areas: All detected items, Quarantined items only and Allowed items only. 4) At last, feel free to go to Settings tab to perform detailed configuration if you like. Latest update: Windows Defender replaces Microsoft Security Essentials in Windows 8 or other newer Windows OS, so don't use this security software in those OS. Return to top of "How to Use Free Antivirus - Microsoft Security Essentials"! !